Jacques Pépin shares expert tips and two delicious recipes that make it easy to bake perfect soufflés every time. Which ambitious dish do F&W readers wish they could master? Our poll came up with one resounding answer: soufflé. Jacques Pépin shows how to create both a sweet and a savory version. 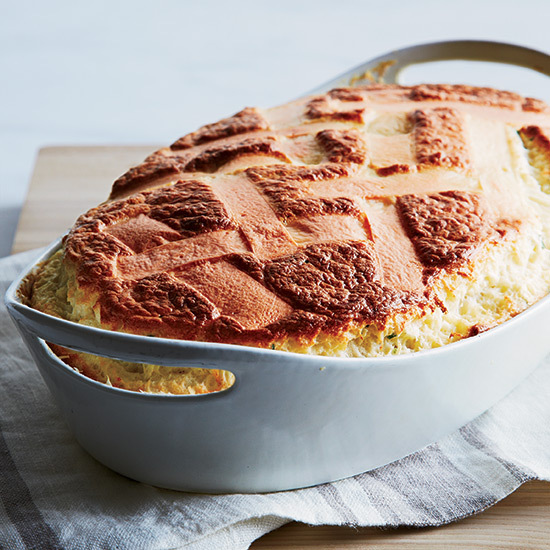 A perfectly puffy soufflé can seem like a small miracle. To learn the basics of making one, I headed to The International Culinary Center in New York City for a lesson from the legendary master of French technique, F&W contributing editor Jacques Pépin. Pépin pulled out a copper bowl, explaining that the metal interacts with the egg whites to make them more stable as they take on air. Then he proceeded to whip up soufflé after soufflé, all the while describing in more detail than I thought possible the finer points of beating egg whites by hand. "Start fast to make them more liquid, then slow down—lifting them with the whisk, and not touching the bowl too much," he told me. But for Pépin, the most important thing when working with beaten egg whites is the timing: Use them right away, he warns, or they'll deflate. "It is relatively easy when you're serving two to four people; a party for 20, though, would be more difficult." Here, his recipes and tips. To get the most crust with the cheesiest flavor, Pépin uses a wide, shallow gratin dish, then creates a lattice on top with thin slices of American cheese. A soufflé ramekin would work too. This soufflé features preserved fruits and kirsch (cherry brandy). "The base for a sweet soufflé is traditionally pastry cream," says Pépin. He substitutes béchamel here—it's "basically the same thing, but easier." Egg Tip: Egg whites can yield different volumes when beaten. "Sometimes there's extra that won't fit in the dish—that's OK," says Jacques Pépin.